Well, we have had a yucky past couple of days!!! Tyson and Melissa our Landlords caught a mouse last week and so we went on mouse alert! Wednesday I was cleaning and opened the cabinet under sink, I was going to grab a trash bag and sitting on top of the box was.............................................................. You guessed it a Mouse!! I screamed and jumped on the kitchen table and then ran upstairs to get some traps from Melissa. We set traps throughout the whole house. That stinking mouse kept taking the chocolate chips without getting caught. He was getting so brave I probably could have fed him right out of my hand towards the end. We saw each other about 15 times. Our Kitchen wall boarders our bathroom wall, so even while going to the bathroom that stinking mouse poked his head out of a little hole to say hi. I didn't think that was very nice at all! We finally got some ultra sensitive traps and he was caught in 5 minutes. Total we have caught 4 mice and Tyson and Melissa have caught 5. We had a bet going and whoever caught the most mice didn't have to bring treats next time we play games. I have to say I am just fine not winning this bet!!!! We have been mice free for 2 days now! Yea!!! So we think we got them all thank heaven. I hope none of that was to disturbing for any of you. It was not a fun thing but I am proud that I survived. :) Although the mice weren't trying to take over the world they sure seemed like they were going to take over the house. Ha ha ha. That is funny. We lived in my parents basement for a while and had mice. LOTS of them! YUCK! I am glad you survived and got rid of them all! 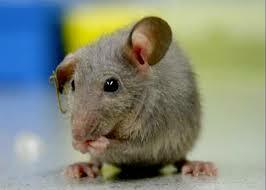 Mice are cute, but not so much when they are running all over your house! Mice are not fun. Just be glad you don't have big giant SPIDERS!!!! LOL!!! I can just see you jumping on the table to escape the pesky rodents. I would probably freak out too. Glad you caught them! ARE YOU READY FOR SOME FOOTBALL!! !